The 2018 TPR Coaster Poll is now OPEN! UPDATE: The bug that prevented new users from marking coasters as "ridden" has been fixed! The TPR Coaster Poll is BACK! We're excited to announce that after a successful live beta test last year where we received a number of ballots on the level of the legendary Mitch Hawker poll, we will be doing the TPR Coaster Poll on a yearly basis. 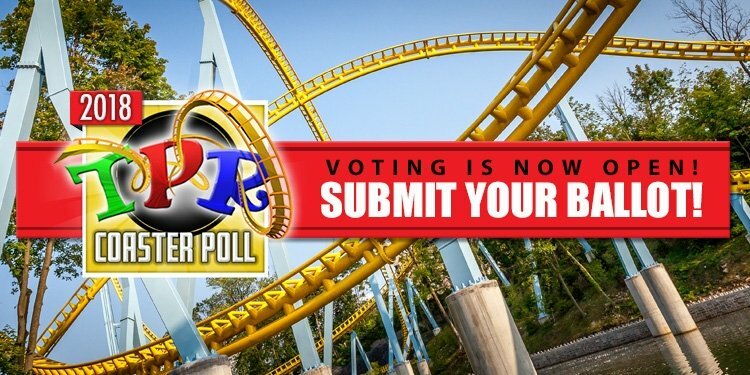 We have over ONE THOUSAND coasters that you can rank on the poll, so whether you've been on every Intamin coaster in the world, or only have been on the coasters at your "home" park, your vote matters! This year, we're also taking steps to promote the poll on Theme Park Review's social media channels. If you're one of TPR's followers on social media, and you're reading this for the first time - welcome! So how do you vote? Follow these steps! 1. Go to coasterpoll.com. That's the easy part! 2. Click the green "Sign Up" button at the top right of your browser window. This will be your login so that your vote will be counted, and your rankings will be saved for next year. If you are already a member of the TPR forums, we kindly ask that you give yourself the same username that you have here. 3. Search for parks and coasters that you've been to! You can use the search bar at the top right to search for a specific coaster, or use the "Coasters" link at the top left to see the the full list. When you're viewing the full list, you can use the "Change List" button to sort or filter the list out. You can view all of the coasters at one particular park, or all the coasters by one manufacturer... It's up to you! 4. IMPORTANT - Mark the coasters that you've ridden. Next to every single coaster is a green "ridden" button. If you've ridden a coaster, click that button and it should turn to a solid green color. You need to do this for every coaster you want to rank! 5. Rank your ridden coasters! When you click the "Ranking" link at the top left, you'll be taken to a listing of all the coasters you've marked as ridden. Now, you'll want to assign each coaster a number rank. You can either drag and drop each coaster to the order you want, or complete your ranking in a spreadsheet style. It's up to you! You can also give coasters tied rankings if you want, like if you can't decide what your favorite Vekoma SLC is! 6. If you voted last year, make sure you click the yellow "Not Done Yet" button to "release" your rankings so you can add the coasters that you've ridden in 2018. 7. IMPORTANT - Click the green "Done Ranking" button! When you click this button, you're all set! If you ride a coaster between now and the day the poll closes, you can go back to your ranking and click the yellow "Not Done Yet" button and adjust however you please. Don't forget to click the green button when you're done. Voting closes at 11:59 PM on March 15, 2019! Just like Mitch’s poll you will find that not every roller coaster is included, as that would be impossible, but we have included as many relevant ones as possible. See the next post down (the FAQ post) for more info on our selection process. The other thing that would really help us out... Please SHARE this link as much as you can! On your social media, on your blogs, in any videos you might produce, etc, getting as much data as possible will allow this poll to get better and better! This has been an ongoing team effort by Chase (Comeagain? ), Robb (robbalvey), and myself (A.J.) and we're so happy to kick it off for real this year. We appreciate your support and we look forward to seeing the results as much as we're sure you all do. Have fun, and happy ranking! Last edited by robbalvey on Thu Feb 28, 2019 9:51 am. Re: The 2018 TPR Coaster Poll is now OPEN! Here are some Frequently Asked Questions regarding the poll. How does the poll work? The way coasters are ranked is based on whether riders prefer one coaster over another. The more that one coaster is preferred over all other coasters, the higher its individual rank is. It's not just about how many votes a coaster gets. How did you decide which coasters to include on the poll? Generally, any coaster that is the size of a wild mouse or larger is included on the poll. However, there are exceptions - a few smaller coasters are on the poll, and a few larger ones aren't. Selecting the cutoff based on size means that we can be objective about which coasters are included. In addition, we require that coaster has to have operated for the majority of the season to be considered. Are large traveling coasters such as Olympia Looping included on the poll? Yes! Search their names or find the park called "Traveling". I've ridden so many coasters that I don't feel like individually ranking them all. What happens? You can rank your coasters in batches if you want! For example, you can give your "best" coasters all tied ranks of #1, then your "awesome" coasters all tied ranks of #10, "good" #20, and so on. Or, you can just choose not to rank coasters you consider as "okay" or "average". Or, you can rank your top 50, and then give your "middle" coasters all tied rankings, and then rank your bottom 10. It's up to you! The poll cares about how coasters compare to each other, not just which ones are ranked first or last on peoples' lists. I can't recall which of the Vekoma boomerangs I've ridden is the best. Does it matter? For "cloned" coasters such as Vekoma boomerangs, B&M Batman inverted coasters, and the like, we have "aggregate" entries. You can search for the word "clone" and they will all show up, or you can rank a cloned coaster individually. All the appropriate entries will be averaged together and the aggregate entry will be the one that gets ranked in the final results. We have done it this way so that casual users can search for the Hersheypark Sidewinder without knowing that it's a Vekoma boomerang, for example. My favorite coaster is missing! Why is that? We've gone to great effort to include every major coaster on the poll, but we may have missed one. If it meets our "rankable coaster" guidelines, and there is enough of a desire to include it, leave us a comment or a reply to the TPR Forum thread and we'll look into it. Will I be able to see other peoples' ranking lists? No, we won't be making any users' ballots visible. We understand that previous polls have done it this way, however, we value privacy. If you want to publicly share what your top coasters were, great! However, we won't force that on anyone else. Last edited by A.J. on Fri Feb 01, 2019 5:12 pm. Ah damn, Green Lantern First Flight is still on the list so I can't rank X2 as the absolute worst coaster ever quite yet. I dunno if I am just doing something wrong. I added all my new for 2018 coasters, but cannot drag and drop to insert them into my rankings. It seems in active or something? Same with spreadsheet option, it just won't let me type in new numbers. Thanks again for all your hard work! Taylor Finn wrote: I dunno if I am just doing something wrong. I added all my new for 2018 coasters, but cannot drag and drop to insert them into my rankings. It seems in active or something? Same with spreadsheet option, it just won't let me type in new numbers. Thanks again for all your hard work! I couldn't update it on my phone or in Firefox (with the drag and drop or spreadsheet) but Chrome works for me when I disable the adblocker (every adblocker is probably different though, I don't know why this matters). Last edited by coasterbill on Fri Feb 01, 2019 8:26 am. If you voted last year, click the yellow "Not Done Yet" button. Then drag everything in, and click the green "Done Ranking" button. ^Whoops. Thank you for that heads up. I see that right in the instructions. So I'm sorry for missing that when I read through. It keeps saying I'm not allowed to mark a coaster as ridden. What's up with that? Can you tell us what browser / OS you're using? When I click ridden next to a coaster, I get a big red forbidden box in the upper right hand corner. Happens on anything I click ridden for. I have tried it on Chrome and IE with the same results. I'm on Windows 7. ***UPDATE*** - Works for me now. Thanks for the fix! Last edited by ADxIxDxAS on Fri Feb 01, 2019 7:56 pm.